Over the last month, you’ve heard wineries talking about getting to the end of harvest. But what exactly does that mean? When is harvest really over? Good questions! Most people assume that harvest ends once the grapes come off the vine. However, that’s just the starting point. The wine industry takes a longer view and considers “harvest” to be the series of steps that turn the wine grapes into stable wine, involving not one, but two separate fermentations. Step 1: Wine grapes are removed from the vine, or “harvested,” and taken to the winery. Step 2: The grapes are crushed and the crushed fruit, called “must,” has yeast and yeast nutrients added. Step 3: The yeast ferments the grape sugars into heat, carbon dioxide and alcohol. Step 4: The “must” is pressed after there is no more sugar left to ferment. Step 5: The new wine is put into barrels and freeze-dried malolactic (ML) bacteria is added to complete the secondary ML fermentation. 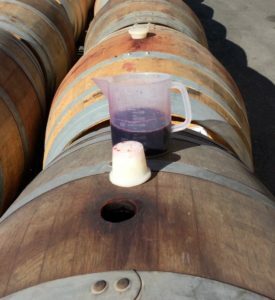 Step 6: ML fermentation transforms malic acid to softer lactic acid, and the wine is pumped out of the barrel, then racked off the gross lees. The wine can now be considered stable and only then will “harvest” be complete! The wine grapes we harvested this fall are currently undergoing the secondary ML fermentation, (Step 5), which typically takes 4 – 8 weeks to complete. Once the wine is racked, we will blend it, adjust the SO2, and then the wine begin can begin its barrel aging. The video below shows Janice tasting each barrel after pressing and ML inoculation, (Steps 4 & 5), to make sure each barrel is quietly fermenting.